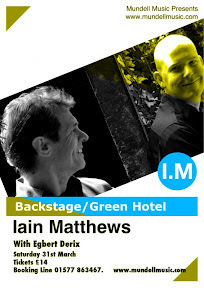 Iain Matthews returns Backstage in the Green Hotel, Kinross on Saturday 31st March 2012. He will be Promoting his new Album that has Jazz influences. Should be a memorable GIG. Tickets can be bought from 01577 863467. AMundell Music Presentation. GIG Posters for Backstage, Kinross.